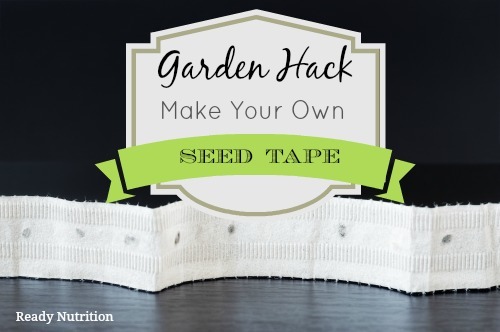 Try this easy diy seed tape and watch how quickly your seeds will sprout! Those perfectly uniformed rows of vegetables are next to impossible when you are sowing seeds directly to the soil – until now. This simple garden hack is the most efficient way to make the most of your garden space. As well, it uses biodegradable paper that will add nutrients to the soil when composted. Gardening couldn’t get any simpler than when I stumbled upon this garden trick. Now I never have to wonder if my seeds have germinated! An added benefit is that I don’t waste as many seeds. This easy, inexpensive way to get your seeds right where you want them is a great project to get the kids involved in gardening too! Soak your larger seeds. I have also found that larger seeds like beans or peas can be soaked overnight before being added to the seed tape. This will cut down on the waiting time. Check spacing on the back of the seed packet. Some seeds like a little more room to roam, so make sure you have the right spacing. Use the right paper when making your strips. Make sure you use black and white newspaper as these are less harmful to earthworms and will decompose faster. Paper towels can also be used, but may be a more expensive alternative. Label your seed bags. It’s easy to forget which seeds are which, so pre-label your bags to stay organized. Don’t go crazy on the water. When you are spritzing your seeds, water just enough to thoroughly wet the seed tape. If you over water, you risk the newspaper disintegrating. Cut strips of newspapers. Cut the newspaper from top to bottom into 1-inch-wide strips and set aside. Lay the strips on a table and place a single row of seeds along each one. For correct spacing, read the back of the seed packet for specifics. Usually spacing vegetables like peas, radishes, and spring onions need to only be 1 inch apart, but there are other vegetable types will need to be spaced further. Add another 1 inch strip of newspaper and spritz with a water bottle and saturate the newspaper. Roll up and gently place in a pre-labeled plastic sandwich bag. Store in a cool dry place until planting time. You should see germination in as little as a few days or up to a week. Continue spritzing with water as needed. When your seed tape has thoroughly sprouted, it’s time to get them planted in the soil. 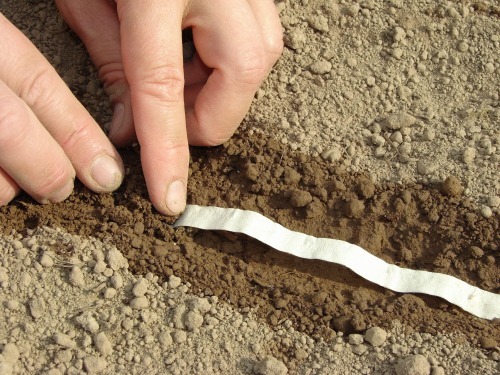 Plant by laying tapes in rows and covering with a fine soil to the recommended depth. Keep seedlings moist until they have established. In a few weeks, douse them with compost tea or fertilizer.